Home > Let’s wear a mask! 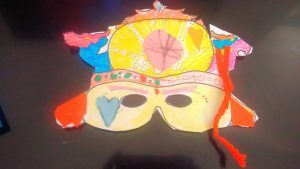 Create your own Carnival mask inspired by the characters of the Puccini’s operas. There are all sorts of characters : ladies and knights, cowboys and indians, princesses , painters, geishas, marine officers, and mandarins. There are also three strange masks called Ping, Pong and Pang! We can even create the mask of an Emperor with colours, carton and clothe! Recommended for children aged 4 to 10 years. Duration: an hour and a half. Previous PostTheft at the OperaNext PostCharacters to the rescue!! !